I have so many people look at me like I have 3 heads when I tell them I cloth diaper my little ones. It is really SO incredibly simple and easy and has worked so well with us (but is easy to get overwhelmed with information). I thought I would walk those who are interested through the how to’s of cloth diapering – trying to make it as easy to understand/read as possible. 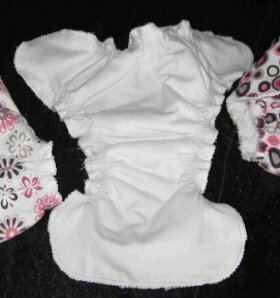 Fitted dippers and covers: These are cloth diapers that have elastic in the legs and usually some kind of velcro closure on front. They are very similar to a disposable diaper except they are made of cloth. These need a waterproof cover as well. These, however don’t need to be folded when put on but do take a little longer to dry and cost quite a bit more. (I did make some of these and they are simple to make for someone with basic sewing skills). Both the prefolds and the fitteds are a little more economical because they use a separate waterproof cover that only needs changed when it gets poop on it or otherwise once a day or so, therefore you don’t need too many covers. 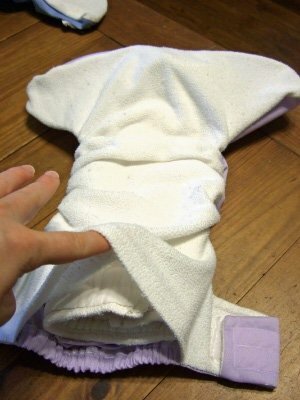 Pocket diapers: These are basically a water proof cover with a micro fleece liner and they are “hollow”. You then add absorbent material to the “pocket” in the back to make them work. They go on like a disposable once they have been stuffed. You change both parts with each change, therefore making them a little expensive but more convenient. When you put them in the diaper pail you “shake” the absorbent part into the diaper pail and then toss the cover/liner in too. AIO (All in ones): these are exactly what you think they are – basically a one piece system. It is made up of a waterproof exterior with absorbent interior and elastic around the waist and back with velcro or snap closure. The best way to describe these are like this: Same as disposable diapers, except you wash them. Because they are one piece and can’t be “disassembled” for washing, they can take more time/water to get clean and they take forever in the dryer! Now I want to start by saying, if you are a parent you are going to occasionally come into contact with poop (as well as blood, vomit, spit up and various other bodily substances) and there is now way around it! With that said, I don’t touch poop more or less than I did when I used disposable diapers. If the diaper is just wet – Take the diaper off and toss into diaper pail! Put a fresh one on. That simple. If the diaper is dirty – “plop” as much of the poopy into the toilet as possible and flush. That is it! If the poop (sorry if TMI) is gooey – like peanut butter and sticks a little – use an old spatula stored in the bathroom for this purpose to help “ease” it off the diaper. There are also diaper sprayers and they are AWESOME! They work like a kitchen sprayer but attach to your toilet to spray the poop off. When done toss diaper in diaper pail. If the infant is exclusively breastfed (no solids) you can skip this step all together and treat the diaper as you would a wet one and throw it in the pail without doing anything. After your diaper pail is full, or you are about to run out of diapers (I wash every 2-3 days, although with a newborn you will probably be washing every 2 days) remove pail liner from diaper pail and turn inside out to empty diapers into wash, then toss in the pail liner (pail liners are just a washable, waterproof “trash bag” of sorts). It is nice to have 2 pail liners so that you can have one clean to go in your empty diaper pail. For a diaper pail I use a tall kitchen trash can with a lid and a washable liner I bought from www.greenmountaindiapers.com. (I really don’t get a commission or anything – it is just where I buy all my stuff and I am quite pleased with them – never bought from anywhere else.) So now your diapers are in the wash run a cold rinse or short cold wash first (this is in place of dunking them in the toilet). Once your cold rinse/wash is done, add your detergent (more on this later) and put on your longest hot/cold wash and set your water level at it’s highest setting. Add another cold rinse at the end and Ta-Da – clean diapers. We have a Electrolux front load and our wash routine is this: Cold rinse/spin and then a “white”wash with 1 tbsp of Tide HE detergent – that is it (our “whites” setting already has a pre-programmed extra rinse) Now you can either dry them on the line or in the dryer. If you dry them on the line you can throw them in the dryer, mist them with some water and essential oil mixture and tumble on low for 10-15 minutes to soften them a bit. And there you have it. After about 2-3 hours of your washing machine doing all the work you have a fresh stash of diapers – beats running the the local Walmart for them! A Note about your detergent: I have used several different detergents (Charley’s soap, Country Save, homemade and Tide HE) but there are certain detergents that are okay and certain ones that are not. The cheaper, the better, because these “cheap” detergents don’t have the fragrance, brighteners, etc that can irritate baby’s bottom. Experiment with what works for you. Do NOT use fabric softener or fabric sheets – they will cause water to repel (and we want these babies to ABSORB!) and they can really irritate your baby’s bum! If they don’t smell clean out of the washing machine – add a little more detergent and wash again. If they smell like ammonia immediately after they come off a baby’s bum – use a little less detergent (could be detergent build up), adding 1/4 cup vinegar in the first wash (either in the fabric softener part or in a downy ball) which helps rinse out the detergent. Once we had toddlers in the diapers, none of these seemed to work to keep the ammonia smell down. Even though most cloth diaper sites will tell you this is a big no-no it is the only thing that makes our cloth diapering fool proof: add a tbsp of bleach to the rinse or wash. That tiny little tbsp of bleach has keep the smellies away and our diapers are fresh and clean! A little goes a LONG way though and the more you use the more you will wear out your diapers faster. You may not need bleach. Or you may. Everyone’s water is a little different. (We live in the country and don’t have that little bit of chlorination that city-folk do so this could be the issue for us?) Do what works – if you have to add a TINY bit of bleach – it is way better than the TONS of it they dump on disposable diapers that make them that wonderful shade of bright white. I will say that there is a learning curve to this. 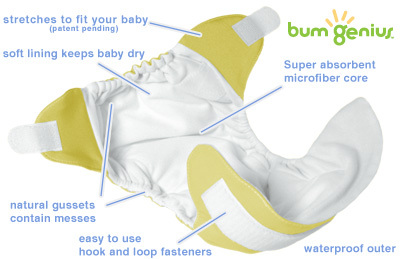 But after a couple of days you will be confident enough with it to fold and change a cloth diaper without thinking. 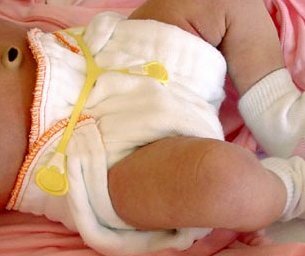 I can change a cloth diaper as fast as I can changes a disposable diaper. This is the fold most people use (for girls and boys) in covers. 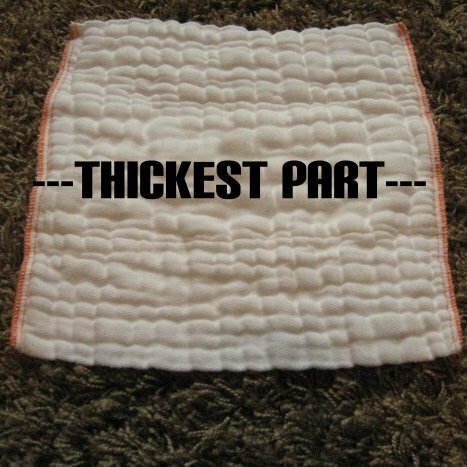 Place the diaper with the thickest part running up and down and fold each side on top of the middle like an envelope. Place in cover. This fold is the exact same as the first except you start with the thickest part laying side to side, then fold the sides to the middle. Place in cover. 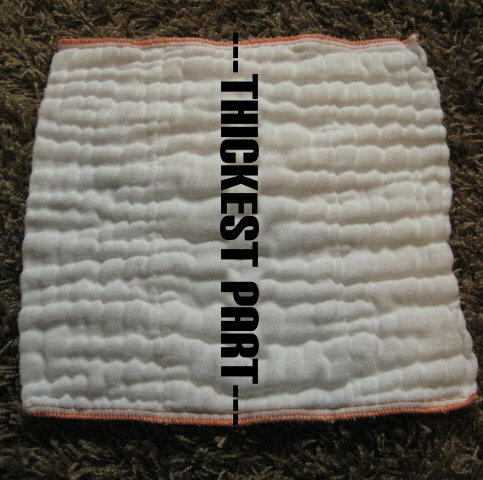 Lay the diaper under baby flat (with thick part laying up and down) with the cover underneath. Fold in sides in the front, bring up with cover and secure cover. Wipes – I use cloth wipes. It doesn’t make sense to use disposable wipes (that usually have tons of extra chemicals to “preserve” them that can irritate baby) and then have to separate the wipes (to throw out) and the diapers that go in the pail. Just toss both in the diaper pail. You can either wet a few at a time and leave them in a tupperware on the changing table or you can use a squirt bottle with water (and baby soap if you would like) to moisten baby’s bum and then use a dry wipe. I have done both – and both work well. You can buy wipes already made for .50 to 1.00 each, but I made mine from scrap flannel and then zig-zag stitched or serged around the edges so they wouldn’t fray. They were free, in really cute prints and work very well. I made them so that when they are folded in half they fit perfectly into one of those plastic travel wipe cases. Diaper pail – Mine is a kitchen trash can with a size large pail liner. They are fabric and waterproof and keep you from having to scrub the diaper pail out each time (I have yet the need to scrub my pail, because nothing touches it). On a side note, one of the things that I was MAJORLY afraid of was the smell of a cloth diaper pail. Before we switched we had tried diaper genies, regular diaper pails, those flipping pail things, EVERYTHING! We always had issues with smell. I really thought that cloth would be as bad or worse. To my surprise the diaper pail really doesn’t stink! Because I wash every 2-3 days and the fact that the “bad part” is flushed away before going in it doesn’t smell bad at all. I also take one of my cloth wipes and sprinkle a drop or two of lavender essential oil on it and throw it in the pail. Keeps it smelling good! Diaper sprayer – Okay, after 4 kids, I finally broke down and bought a diaper sprayer. I SO wish I would have bought it a long time ago! It makes rinsing out those really stubborn poopies a cinch! When you buy one make sure the fittings are of high quality (you usually get what you pay for), you don’t want that thing springing a leak. Mine is a Bum Genius brand and was $40. It has an adjustable spray so you can raise and lower the pressure and turn it off with a simple lever. That way the kids aren’t using as a “sprinkler” in the bathroom! Doublers – At night older babies might need a little more than just one diaper to keep them dry for 12+ hours. All you need to do is add some more absorbency to the diaper. I actually use the small diaper (like the newborns) folded up and placed on top of his regular one. You can buy doublers and you can make them by sewing 3-5 layers of 100% cotton together in a rectangle ( I made some out of old t-shirt that I cut up). You can also just use the old smaller sized diapers. People often wonder if I use disposable diapers when we are out an about or when we are traveling. I usually don’t. (With the exception of when I know someone else will be changing them like church nursery staff). Leaving the house with cloth diapers is just as easy as leaving with disposables. If you are just out for the day you pack just as you would with “sposies”. Two diapers is usually what I take, obviously you need to base it how old your baby is and how many diapers they go through in “x” amount of hours. The only added thing you have to take with you is a wet bag or large ziplock bag for your dirty diapers. When you change your baby, just throw the dirty diaper in the wetbag/ziplock bag and it into your diaper pail when you get home. “Wet bags” are just reusable cloth bags that have a zippered opening made from two layers – an inner waterproof layer and an outer fun/fashionable one. These are just thrown into the diaper pail as well and get washed along withthe diapers. Buying one of these bags actually saves you money in the long run, because they are washable and you can use them over and over. If you are out and about often, 2 bags in rotation work best. Another nice thing to take with you when you leave is an extra cover, just in case some poopy escapes the diaper and the cover gets a little dirty. This saves you from having to wipe out the cover and reuse it, just put on a fresh one and deal with the soiled one later. Once you leave a couple of times you will be a pro and wondered why you ever thought it would be difficult at all. Now if you are going to be gone for a while, just bring your pail liner to use as your mobile diaper pail and more diapers. If you are staying long enough that you will run out of fresh diapers, you will have to find a laundry mat or have access to a washing machine so that you can replenish your supply when it dwindles. That simple! Thank you for this! We are on baby #4 and this is the most practical guide I have found on cloth diapers!!! (Baby #3 is still in diapers and disposables were just costing sooo much!) We also are homeschooling and I appreciate all the advice and work you put into your blog and YouTube channel. Hi! Just wondering what you do about diaper rash with the wet cotton against their bum… Did you ever run into that issue? Yes, I use cloth on the go. I find it more trouble to switch back and forth all the time. I only keep a few diapers in my diaper bag and reload often. I like thirsties, bummis, flip and blueberry capri covers.